Capital Cresent and Little Falls intersection. Image create with Google Maps. 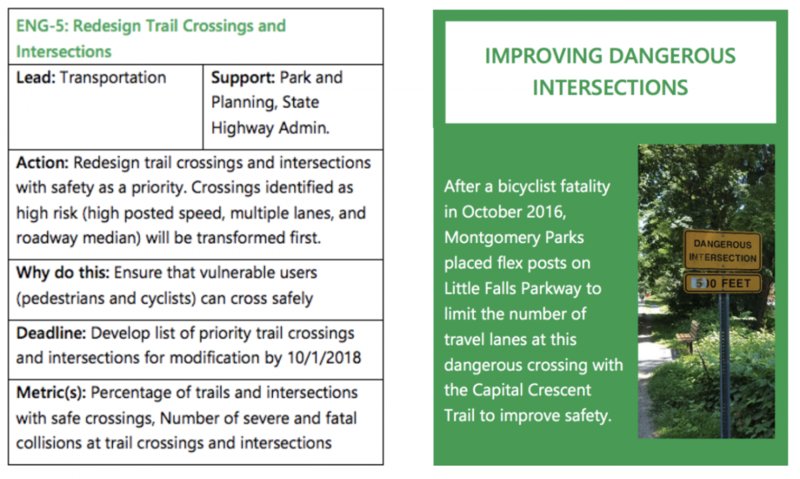 After a cyclist was struck and killed by a driver at the intersection of the Capital Crescent Trail and Little Falls Parkway in late 2016, the local parks service put in temporary measures to slow traffic in the area. So far this “road diet” has been successful, and the Maryland National Capital Park and Planning Commission (M-NCPPC) Parks Service is considering what elements to make permanent. The current temporary road diet removes two of the travel lanes by blocking them with temporary flex-posts. Unfortunately, some residents have expressed a desire to return to the former dangerous four-lane design, even though the county has called four-lane trail crossings like this one “high risk.” Safety advocates need to speak up. Current temporary road diet at the intersection. Center lanes are travel lanes while outer lanes are blocked by temporary flexible bollards. Image created with Google Maps. M-NCPCC presented the wide range of potential alternatives at a public meeting on June 13, which can now be viewed in full on the project website. Despite the apparent success of this road diet, there was a vocal contingent of people who favored returning the intersection to four lanes. Opponents' arguments against the road diet seemed to fall in four main groups. 1. “I get slowed down at this intersection”: Several drivers expressed frustration over being delayed by trail users trying to cross at this intersection. Despite these anecdotes, M-NCPCC believes drivers have successfully adjusted to the interim conditions. Returning to four lanes would not address delays due to trail users because drivers will still be required to yield, but this would make the area more dangerous for people walking and bicycling. Some project alternatives would replace the Arlington Road stop light with a roundabout while restricting the trail crossing to two lanes. 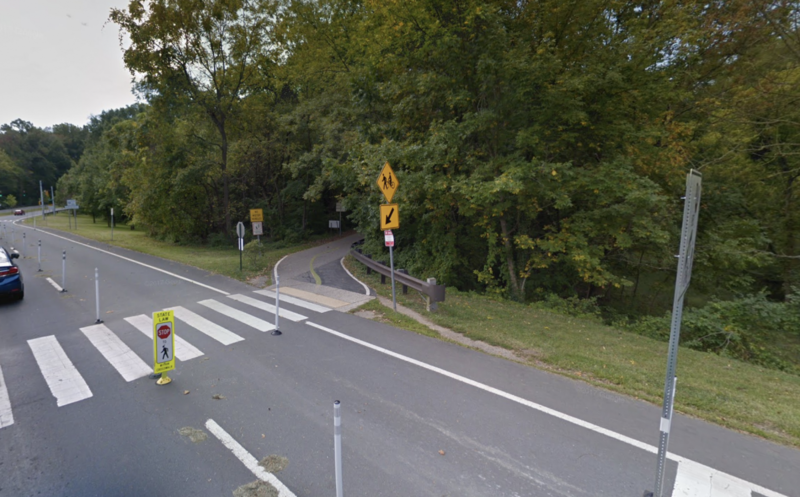 This and other measures like closing the Little Falls Parkway entrance to the Bethesda Pool could potentially keep traffic moving while also protecting more users. 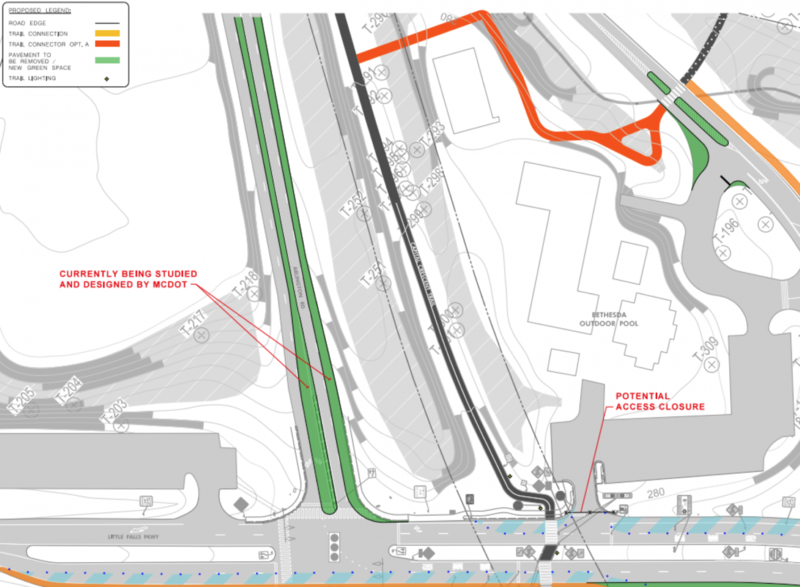 Calming measures for Arlington Road and Hillandale Road along with potential Bethesda Pool entrance closure being considered by MCDOT and the project plan. Image from the project plan website. 2. “Traffic is being diverted into our neighborhoods, which is unsafe”: Some think that traffic is being diverted to residential areas along Arlington Road, Hillandale Road, and in Kenwood. That’s a valid concern, though it is unclear how much data exists to support it. Even so, subjecting trail users to old dangerous conditions in an attempt to mitigate this simply trades safety for one group for danger for the other. Traffic calming measures in the neighborhoods are already under review by Montgomery County Department of Transportation (MCDOT) for both Arlington and Hillandale Roads and this project is coordinating with these efforts. Kenwood already has turns prohibited during rush hour onto Kennedy Drive, some one-way streets, and speed bumps. If further mitigation is needed, there are other strategies available. Safety in the region is not a zero-sum game — all areas can have improved safety without reverting to previous dangerous designs. 3. “There is growth in Bethesda with new apartment buildings under construction, and we’ll need more lanes on our roads to handle this”: The answer to smart growth is not introducing capacity for more single-occupancy vehicles, but rather prioritizing alternatives such as the new Purple Line (which is under construction), adding rapid bus transit, improving Metro, and making the Capital Crescent Trail safer to encourage bike commuting. More road lanes will result in more congestion, more pollution and climate change, and more road and trail deaths. 4. “Cyclists on the Capital Crescent Trail go too fast, are disrespectful, and don’t follow the rules”: There’s no doubt that users of all transit modes sometimes don’t follow the rules whether intentional or mistakenly, and cyclists are no exception. However, the primary goal of this project is to develop a safe trail crossing at this site. While education and enforcement are part of Vision Zero, one of its core principles is to lead with safe engineering design. Humans will make errors at this and at any other intersection, and the permanent design should prevent these errors from resulting in major injury or death. A two-lane intersection or closure of Little Falls Parkway with the other general calming measures proposed in this project will make consequences of the next inevitable mistake much less dire. Once safe engineering design principles are in place, education and enforcement for all users, including cyclists, is welcome! 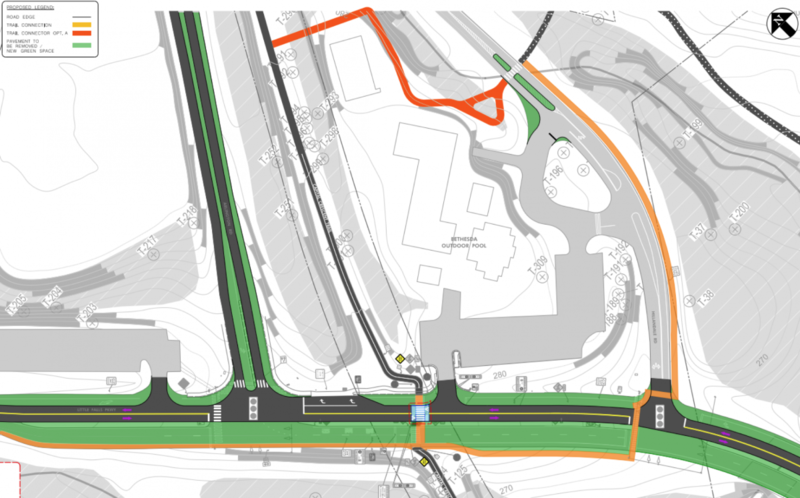 Conceptual design for a permanent road diet for Little Falls Parkway. Image from the M-NCPCC Parks project plan website. The next step in the process is for the project team to narrow the alternatives to three preferred options which will be presented a second public meeting tentatively scheduled for the fall. After that, they’ll present a single preferred option to the Montgomery County Planning Board. If the first meeting was any indication, there is a loud and organized body of neighbors who are pushing to return to the dangerous, old configuration of this intersection, despite local parks reports calling intersections like these “high risk” and saying that the road diet has “dramatically reduced” accidents at the crossing. The county’s own Vision Zero Two-Year Action Plan explicitly highlighted this road diet as a successful measure. Returning to four lanes runs contrary to Montgomery County’s Vision Zero goals. Let officials know that the county should prioritize safety for all users. Comments regarding the project and proposed alternatives can be emailed to the project manager, Andrew Tsai, at Andrew.Tsai@MontgomeryParks.org (also available on the project website). Please tell M-NCPPC Parks that we must not return to a dangerous four-lane crossing at this intersection. You can also email the Montgomery County Council at County.Council@MontgomeryCountyMD.gov, or click below to draft an email to county officials. Ross Filice lives with his family in Chevy Chase and commutes by bike to Georgetown, downtown, and several other office sites in Washington, DC. He is a strong advocate of improving bicycle and transit infrastructure throughout the Washington area. If you are at the Spring Hill Metrorail station and head inbound on the Silver Line, what is the next station you will reach? Feel free to ignore station subtitles.